It’s happening all over the US -- a phenomenon known as dead mall syndrome. A mix of overbuilding of malls in recent decades coupled with dramatic changes in retail habits has caused the demise of many malls. Some however are getting a new lease of life, as something else. And that’s what’s happening to the Westside Pavilion on Pico at Overland in West LA. This week the owners of the Westside Pavilion, Macerich, and Hudson Pacific Properties announced they will be transforming the Westside Pavilion into 500,000 square feet of offices to be aimed at tech and entertainment companies. 100,000 square feet will remain as retail space, including the 12-screen movie theater complex Landmark Theatres and the popular Westside Tavern restaurant. 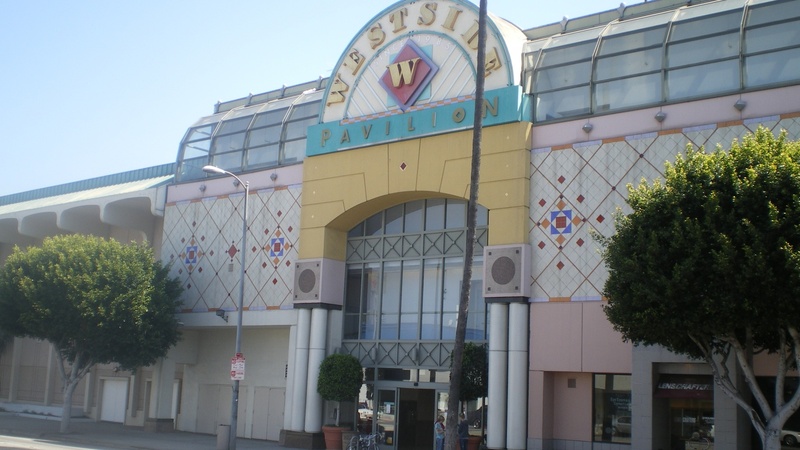 Westside Pavilion was a mainstay of the Westside for several decades. It was designed by the late architect Jon Jerde, the famed shopping mall designer who also created CityWalk and Santa Monica Place and, most famously, the kit of parts for the 1984 Olympics. He worked with his Olympics co-designer Deborah Sussman on the Westside Pavilion and when the building opened in 1985, it was a postmodern fun palace of colorful geometrical shapes and, inside, a galleria of shops that Jerde envisioned as something akin to a Parisian shopping arcade. Older Angelenos will remember that it made waves in retailing with the 1989 opening of a clothing store designed to evoke the early days of French flight called Aeropostale. And its been a movie star, of course -- the mall scenes in Tom Petty's video for "Free Fallin'" were filmed there, and you could catch its exterior in the film "Clueless"
That was then. This is now. Like many malls, Westside Pavilion lost its anchor tenants. Nordstroms left the building, and moved last year to the remade Westfield Century City mall. Macy's is set to close at the end of this month, having already opened a new store at Westfield Century City. Rather than emulate the makeovers of Westfield Century City -- emphasizing high-quality eateries -- and, now underway, The Beverly Center, Macerich instead chose to find a new use for the Pavilion. It entered into a 75-25% ownership joint-venture partnership with Hudson Pacific Properties to retrofit the building for high tech and entertainment companies. According to a Hudson Pacific company spokesperson, the mall is ideal for them because it offers large floorplates and high ceilings. Of course, it will need some work to bring in light into the deep plan spaces and other changes so they are expecting to spend up to $475 million and reopen in 2021. This is not the first change of use for a mall. Some “dead” malls are changing their uses -- and becoming offices or educational buildings. Before this week’s announcement, DnA had heard from residents in the area that the developer Macerich had plans to turn the mall into housing. These residents were unhappy at the prospect of more traffic congestion on Pico Boulevard. Such resistance on grounds of traffic is not new. When Westside Pavilion was being planned in the 1980s, neighbors pushed back then against the project on the grounds of traffic and parking. Hence the copious parking at Westside Pavilion, which now sits empty, awaiting new occupants.